Converged networks have come a long way since the 1990s. New applications like Instant Messaging, Unified Communications, and IP Telephony have accelerated the adoption and the deployment of converged voice and data services in the enterprise. Since its inception in the late 1990s, SIP (Session Initiation Protocol) has revolutionized the way people communicate with each other using converged services. SIP provides the framework for delivering voice, video, data, and wireless services seamlessly and transparently over a common network. Enterprises are increasingly involved in mission-critical transactions and cannot afford infrastructure or services downtime. Enterprises need to provide the customer with the best possible user experience and need highly available and reliable services that meet desired SLAs (Service Level Agreements). 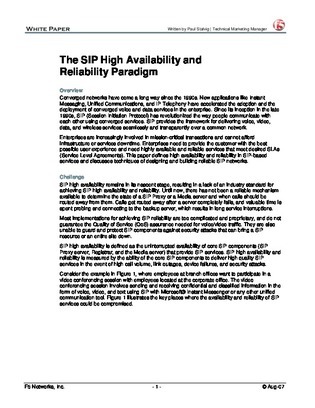 This paper defines high availability and reliability in SIP-based services and discusses techniques of designing and building reliable SIP networks.